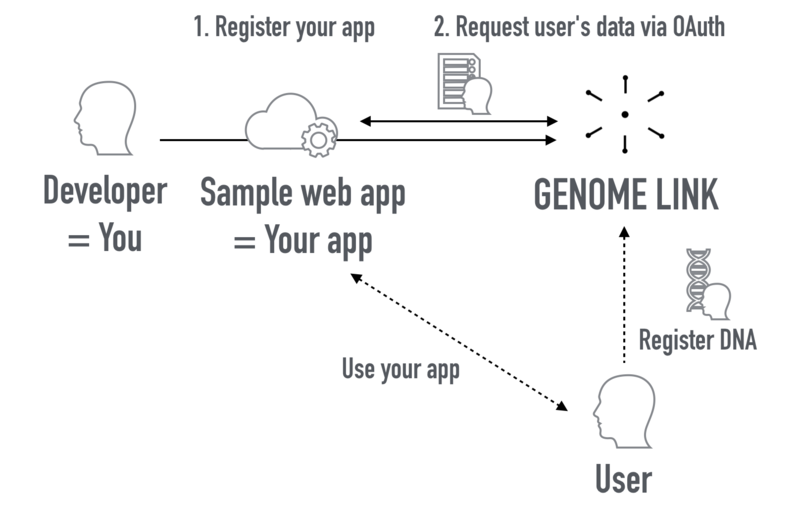 For this tutorial, we will start with registering your app to Genomelink and then run the sample web app ( Python/Flask or Node/Express ) on localhost to request users' genetic insights using OAuth authorization flow. If you are unfamiliar with OAuth, you can refer to a quick overview at OAuth 2 Simplified by Aaron Parecki. Before you can begin the OAuth process, you must first register a new app with the service. When registering a new app, you usually register basic information such as application name, website, a logo, etc. In addition, you must register a redirect URI to be used for redirecting users to for web server, browser-based, or mobile apps. First, if you do not yet have a Genomelink account, create a new one on the SIGN UP page. 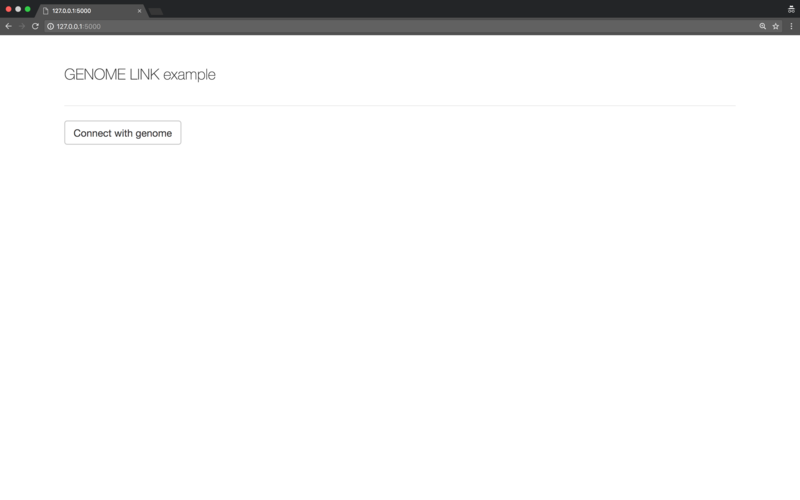 The service will only redirect users to a registered URI, which helps prevent some attacks. Any HTTP redirect URIs must be protected with TLS security, so the service will only redirect to URIs beginning with "https". This prevents tokens from being intercepted during the authorization process. Click on [Save] to finish the app registration. The next page will provide you with new Client ID and Client secret for your app. You will use these to configure your app later in this tutorial. In the [Authorization scopes] tab, click on [Edit] to define the scope (whitelist) of reports that the app will request. 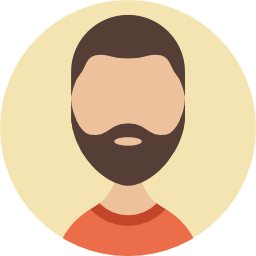 For this tutorial, please tick Eye color, Beard thickness, and Morning person and click on [Save]. 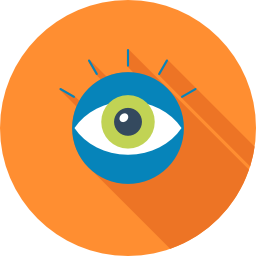 Fetching a protected resource after obtaining an access token can be extremely simple. However, before accessing resources you will need to obtain a few credentials from your provider and authorization from the user for whom you wish to retrieve resources for. After downloading the sample code, set GENOMELINK_CLIENT_ID, GENOMELINK_CLIENT_SECRET and GENOMELINK_CALLBACK_URL as environmental variables and run the sample web app server on localhost. To do so, open Command Line Tool on Windows or Terminal on Unix (Mac). 4. Run the app on your localhost! Open http://127.0.0.1:5000 in your web browser. When a new user visits the app for the first time the Genomelink account will not yet be connected to the app. The app requires his Genomelink data, so he will need to be connected to Genomelink. It's like using the Facebook login and user profile data to link to a third-party app. 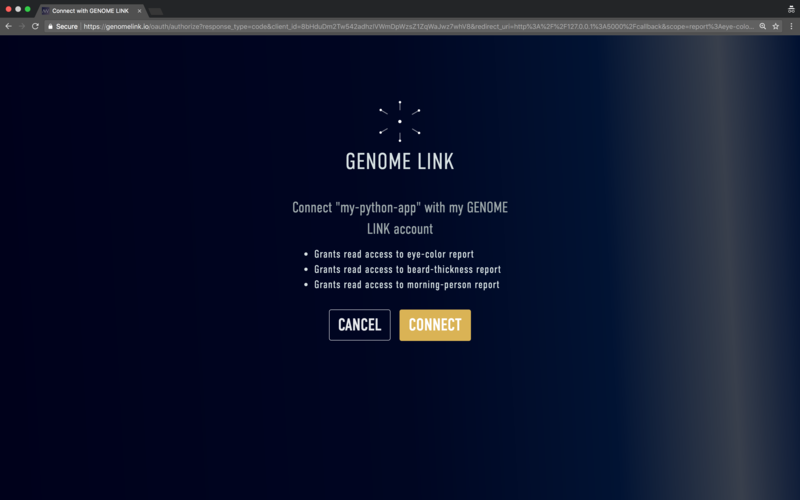 The app puts a "Connect with genome" button with authorize_url link in the index page, so that he can connect his Genomelink's data to the app. The authorize_url is a link to https://genomelink.io/oauth/authorize with client params such as client_id. Open http://127.0.0.1:3000 in your web browser. If you have already logged in to Genomelink with your developer account, log out of your account first since you probably have not registered your genome data yet! Instead, use test users below. These accounts have their genome data already registered, so you can see what will happen when real users come to the sample app. 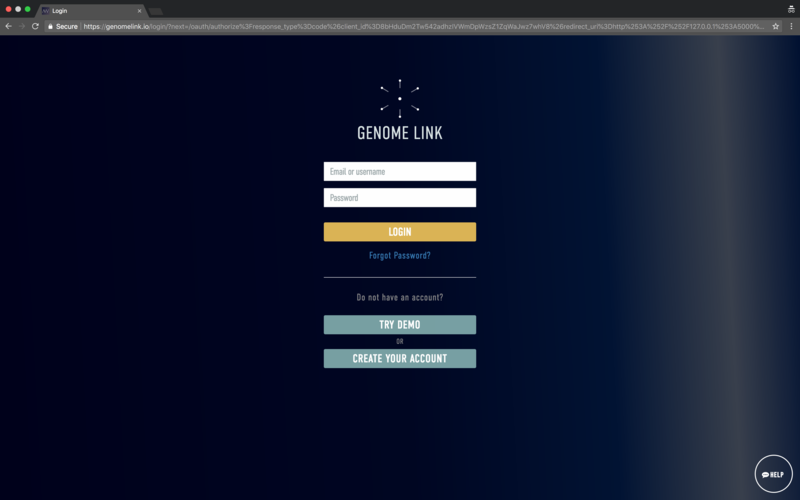 After clicking the "Connect with genome" button, you will be redirected to login page of Genomelink if you are not logged in. Once you login, you will be asked to grant the sample web app access to report data of the account. When you click "Authorize", you will be redirected back to localhost, which you set as GENOMELINK_CALLBACK_URL as environmental variable and is also registered in My Apps console. With this redirection comes an authorization code included in the request URL. We will use that to obtain an access token. Once access token is obtained, we can request his report data. 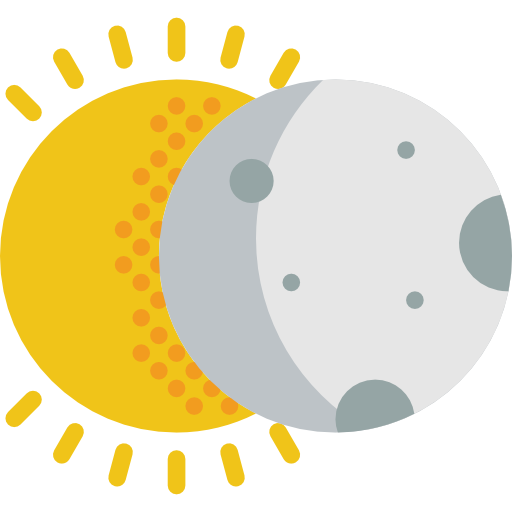 In this sample code we store the token to session cookie and will use it later in index page. Finally, we use the token to get his reports and render them. # Fetching a protected resource using an OAuth2 token if exists. // Fetching a protected resource using an OAuth2 token if exists. Congratulations! You have successfully obtained the real users' genetic insights via OAuth. 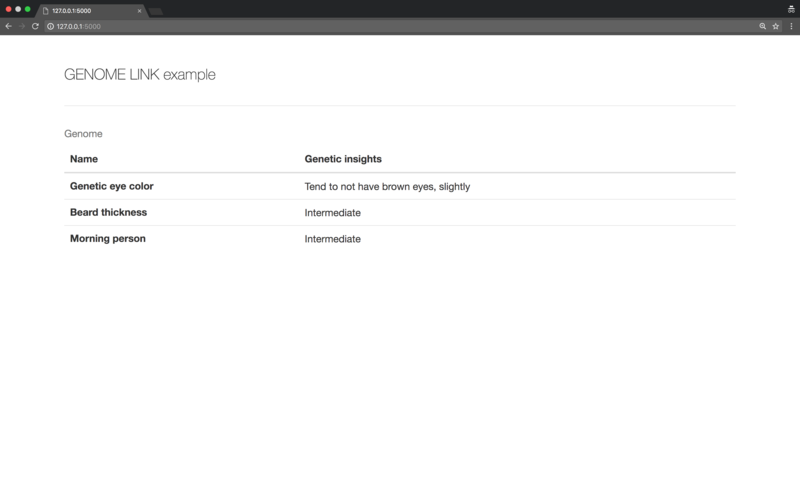 API Reference | How to use API & SDK in detail. List of Reports | 50+ genetic insight reports are available.